Fantastic for on the go fun, the Chad Valley Post Office is sure to bring joy to your little one. 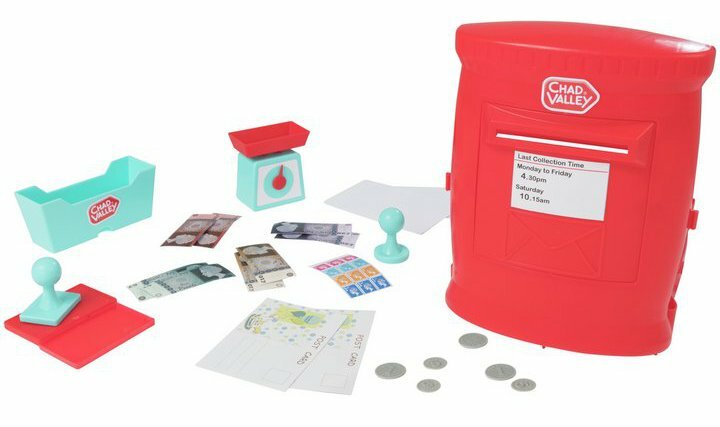 The letterbox carry case opens up to reveal a post office fully-stocked with goodies that your child will simply adore, great for roleplay fun. Realistic weighing scales and a cash drawer allows them to play at being in charge of all post based transactions; from the point of sale and how much to charge, then on to authenticating each package with realistic stamps and an ink pad and finally, once this is done, they can then proceed to 'post' the item - no doubt ensuring you that your precious cargo will arrive on time! When play times over the accessories easily pack away in to back in the letterbox ready for the fun to begin another day. Size H25.5, W17.6, D7cm. Get money off with April 2019 free Argos voucher codes, see if there's a discount code for the Chad Valley Post Office product. 4.7/5 from 13 recent reviews.